The land of the desert and vast open space, Australia is largely an uninhabited nation. Because of this, Australian’s are heavily reliant on fences to separate their boundaries. Whether it be large farms, situated on hectares of land, or suburban new builds, almost all businesses or homeowners are reliant on fences to separate their land or ownership. Fences serve numerous purposes. Whether it be securing cattle, keeping pesky neighbours out or dividing land titles, a fence is an imperative inclusion on any estate. Despite this, quality fences are not easy to construct. The use of a fence post driver or a post hole driver is essential to create the best foundations in a fence build. A post or fence post driver is a customised tool, specifically designed to drive fence posts into land. Consisting of steel, the heavy piece of pipe has handles and is commonly used by one person performing the fence build. With a 12-month warranty and an anti-vibration ‘comfort’ handle, the Bullmax Post Driver is the perfect post driver for almost any fence build. 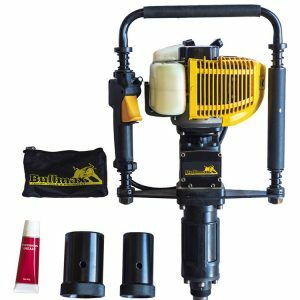 The Bullmax Post Driver comes with a bonus tool-kit, spark-plug and easy pour fuel and oil container to ensure ease of use and only weighs 12.8kgs. 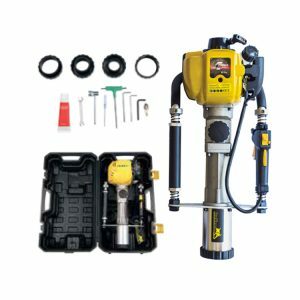 Designed for Australian conditions the post driver is perfect for continuous use and meets the worldwide emission and noise requirement standards. THE BULLMAX MECHANICALISED 4 STROKE POST DRIVER IS THE LIGHTEST IN THE MARKET AND HAS BEEN ERGONOMICALLY DESIGNED WITH THE ENGINE BALANCED TO SIT DIRECTLY ABOVE THE POINT OF IMPACT. IT WILL DRIVE IN STANDARD START PICKETS, MAXI POSTS, VINICULTURE POSTS, GROUND RODS AND GALVANISED PIPE UP TO 50MM IN DIAMETER. FEATURING A UNIQUE 80MM IMPACT PLATE AND FOUR INTERCHANGEABLE SLEEVE HEADS. ALL CONVENIENTLY PACKED IN IT’S OWN CARRY CASE. THE BULLMAX MECHANICALISED 4 STROKE POST DRIVER IS THE LIGHTEST IN THE MARKET AND HAS BEEN ERGONOMICALLY DESIGNED WITH THE ENGINE BALANCED TO SIT DIRECTLY ABOVE THE POINT OF IMPACT. IT WILL DRIVE IN STANDARD START PICKETS, MAXI POSTS, VINICULTURE POSTS, GROUND RODS AND GALVANISED PIPE UP TO 50MM IN DIAMETER. FEATURING A UNIQUE 80MM IMPACT PLATE AND FOUR INTERCHANGEABLE SLEEVE HEADS. ALL CONVENIENTLY PACKED IN IT'S OWN CARRY CASE. <p>I also have retail business myself in Richmond NSW (Newmarket Saddlery) I loved this machine so much I searched for the distributor and we now retail them through our store. They are exceptional value and I believe there is nothing on the market that works this well for the price. <p>We have always found BULLMAX TOUGH TOOLS &amp; EQUIPMENT to be a reliable and professional Company who back their products 100%. <p>It is lighter than all the other brands, is well balanced, easy to use and ½ the price of popular post drivers on the market. We have several of these in or kit and have literally flogged them every day and they just never give up. Awesome product!